The model IS barrier intrinsically safe repeater power supply has been designed for applications in combination with intrinsically safe 4 ... 20 mA sensors. By using different connection terminals, 2-wire as well as 4-wire transmitters can be connected. The analogue measured value is transmitted to the non-hazardous area, galvanically isolated from the hazardous area. On the output side, the repeater power supply can be operated as supplying or non-supplying. The test sockets contained in the COMBICON connectors enable the direct connection of HART® communicators. 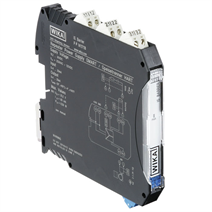 In intrinsically safe circuits, the repeater power supply enables the safe operation of these products. A template to create the proof of intrinsic safety can be found at www.wika.com.